I was in Pascagoula, Mississippi, visiting a friend who was doing relief work a year and a half after Hurricane Katrina had devastated this small city on the Gulf. Katrina, which hit in 2005, has now been joined by other record storms. The destruction of daily life is a template for the storms that have followed, helping us to understand the aftermath of Sandy. I get out of my car and walk up a rise to some front steps – that is all that is visible at first – the steps and the old trees. A closer view reveals a small field of wreckage, a brick pile that had been a chimney, stubby brick piers that had married the house to the earth, and the back steps. And there under foot are bits of the former life – a corner of a marble table top, smashed pieces of good china – a delicate pattern of gold and pink and white; a rusted flashlight; a boot scraper for the doorstep made of horseshoes for good luck; shards of colored glass; a garden hose still wound up on its plastic dolly, standing next to a spigot from the remaining tangle of water pipes; and an intact cookie jar that says: After School Cookies. The cookie jar is in the shape of a house. Only the roof/lid is missing. I take in the intimate scale of this destruction. A storm that is hundreds of miles across, may smash one teacup and leave another behind. This was personal. It’s what we all fear: the forces of the earth — wind and water and fire and the ground itself busting open — coming down upon our family, our doorstep. A house is a small boat. A wall is the thinnest of envelopes, no matter how well built. We know that we will vanish, that everything we have and hold will turn to dust — but we don’t want to believe that, and we certainly don’t want to see it all go in one shake of the earth or one wave. 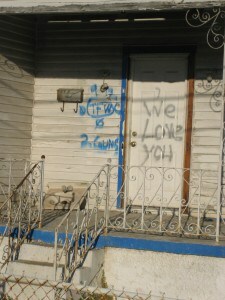 Damaged house in New Orleans’ Ninth Ward. Photo by Howard Mansfield. Once back home in New England I’d tell people: It’s not as bad as you think: It’s worse. We underestimate how hard it is to put a life back together. An ordinary day is held together by small comforts. 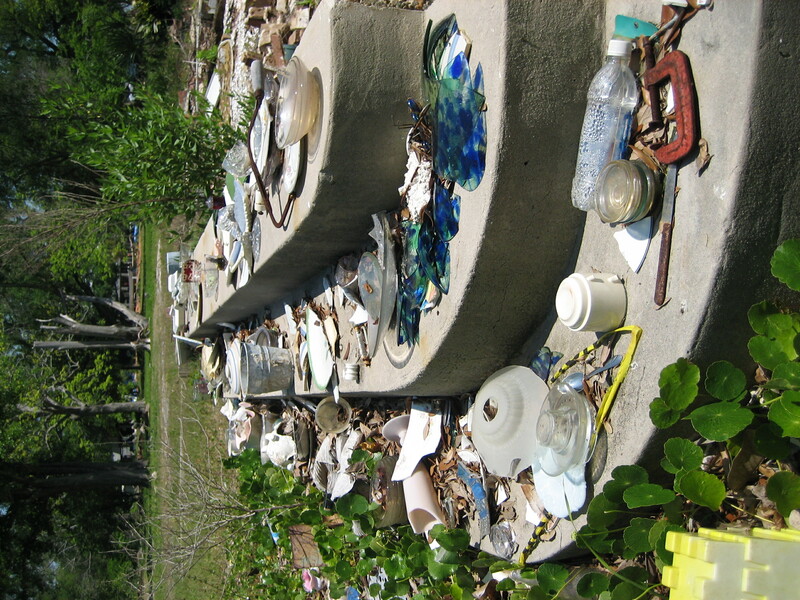 On the back steps of this destroyed house is a display, a broken flea market – pieces of cut glass bowls and dishes, an elegant glass, possibly for some kind of after dinner drink, little bits of blue glass, a rusted and twisted coping saw. This is an altar to the vanished domestic life. 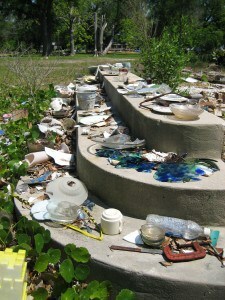 After Katrina, my friend tells me, she would see people picking through the ruins of their house, setting pieces aside. Whatever little they found, they left. They were living in a FEMA trailer, or living with their relatives. They had no room for any of it, they said. Maybe it wasn’t what they had hoped to find. They had really hoped to find a way back to the day before the wind and waves hit. Taking a piece of china or a soaked photo back to your trailer could be a bitter souvenir. I look out to the Gulf, just for relief at first. The view from under the old trees to the silver-toned water is bewitching. I look down again around the foundation. Someone has mowed this lawn. Someone is tending this ruin. Oh yes, says my friend. She went by here once, a few foundations down, and there was a man trimming the weeds away from his foundation slab. His house is now about three inches tall. When I first got here, she says, if I had seen that, I would have thought that he was crazy. With all that needs doing, why do that? But she understands now: You do what you can to restart your life. In another neighborhood, she was cruising with other Red Cross workers to see who needed help. Among the vacant, storm-wracked houses, one was in pretty good shape. A man stood outside watering his lawn. No need to talk to that man, said her fellow workers. No. Wait, she said. She went over and talked with the man. He was impeccably dressed. 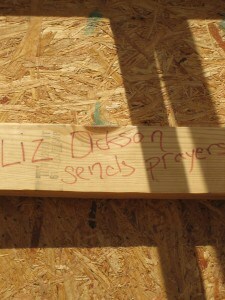 But the inside of his house was gutted – it was down to the studs. Each night he slept on a reclining chair. It was about all that he had. He needed help. You can’t tell from the outside, she says. The houses may be empty; the people suffering, but the roses are in bloom. She tells me about a police officer, dressed in his uniform everyday for work, while at home his family slept on the floor of their gutted house. He was too proud to ask for help. And she tells me about a minister, dressed in a neat shirt and pants, working to help his congregation. He would never let on that these were his only decent clothes, or that his house was destroyed. As in life, as in the aftermath of the storm: We can’t tell from the outside. 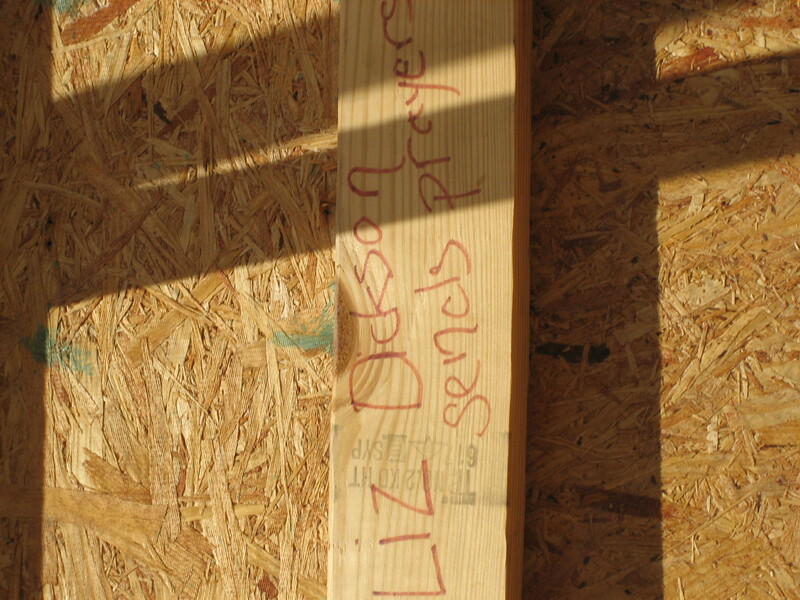 A note left by a volunteer for Habitat for Humanity in a house under construction in the Ninth Ward. Photo by Howard Mansfield. This is the storm after the storm. After all those photos of trees bending in the wind, of houses adrift, of people stranded on roofs or escaping in canoes and boats in the street; after the evacuation and the Red Cross rolling around handing out hot meals, after the storm itself has passed and the sun comes out, there are other storms, but these may be invisible. There are private torments as people struggle to hold on to jobs and marriages, as they struggle with the feeling that they have failed their family. The storm after the storm requires its own kind of relief effort.. It requires our patience and our willingness to help long after the crisis has fallen from the headlines. 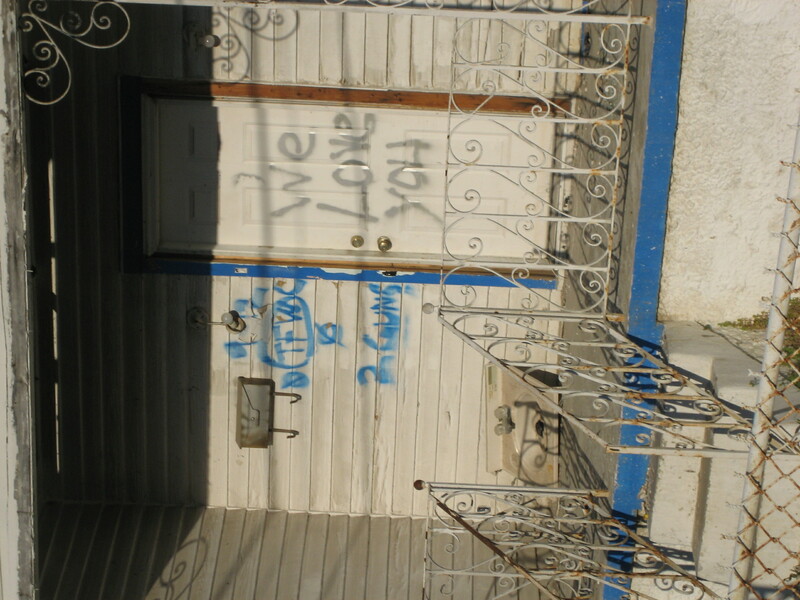 Most of all we need to understand that after a natural disaster, it may take years to heal.